Six leaders and members of the HLOB union at Hotel Tharabar Gate in Bagan were released from prison on March 29 to an emotional welcome from family and union members after serving their full 30-day sentences. The six were tried, convicted and immediately taken to prison on March 1 after being arrested in December for attempting to lead a peaceful march to protest the brutal police destruction of their solidarity picket. Their union has faced continual attacks since it was formed and registered four years ago. In August 2018, management terminated the union chairman along with 11 other workers, including two members of the union executive and 7 active union members. HLOB continues to fight for the reinstatement of the union members and officers terminated last August and the 23 members who were terminated in December for refusing to cross the union picket in solidarity with the 12. In December 2018 the IUF lodged a formal complaint against the government of Myanmar with the ILO Committee on Freedom of Association. The fight for reinstatement and recognition of trade union rights in one of Myanmar's key tourism regions continues - USE THE FORM BELOW TO SEND A MESSAGE TO THE GOVERNMENT OF MYANMAR! The government must rescind the unfair sentencing of the six trade unionists, ensure that Hotel Tharabar Gate reinstates all workers dismissed for defending trade union rights and enter into good faith negotiations with HLOB. Your government continues to fail to ensure respect for freedom of association and the right to peaceful assembly and protest. 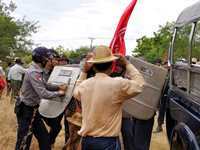 Six leaders and members of the trade union HLOB at the Hotel Tharabar Gate in Bagan were unfairly condemned to one month's imprisonment by the Nyaung Oo Township Court on March 1 solely as a consequence of their attempt to hold a peaceful protest march to the government office on December 12. The six have served their sentences, but the unjust convictions will weigh on them throughout their lives. The government must act to ensure full respect for trade union rights at Hotel Tharabar Gate. For the government to meet its international human rights commitments, the sentences imposed on the 6 HLOB union leaders and members must be unconditionally rescinded. The government must also act to ensure that the 6, together with the other HLOB union leaders and members dismissed in August 2018 are immediately and unconditionally reinstated along with the 23 union members who were dismissed in December for showing solidarity with the 12. The United Nations' ILO is being regularly informed of the government's multiple failures in this regard. I therefore expect swift action on your part.